The Japanese Hill-and-Pond Garden is one of the oldest and most visited Japanese-inspired gardens outside Japan. It is a blend of the ancient hill-and-pond style and the more recent stroll-garden style, in which various landscape features are gradually revealed along winding paths. The garden features artificial hills contoured around a pond, a waterfall, and an island, along with carefully placed rocks. Among the major architectural elements of the garden are wooden bridges, stone lanterns, a viewing pavilion, the torii or gateway, and a Shinto shrine. The Japanese Hill-and-Pond Garden is an excellent place to experience the cherry blossom season from April to May—over two dozen trees from BBG's diverse ornamental cherry collection are planted here. Learn about BBG's cherry trees. Unlike the formal, highly manicured gardens of Europe, Japanese gardens are designed to mirror nature, particularly Japan's rocky coastline and mountainous landscape, using trees, plants, and structures on a scale that creates an impression of greater space. Simplicity and "harmonious asymmetry" are important principles in Japanese gardens, as are a balance between the man-made and natural, and impermanence and constancy. Evergreen plants (especially pines), which symbolize permanence, predominate here; brightly colored flowering plants are used with restraint. Many of these plants are traditionally found in Japanese gardens, including Japanese irises, wisteria, Japanese maples, and azaleas. Japanese flowering cherries, which mark the beginning of spring and the season of hanami (flower viewing), grace the shoreline of the pond; the beautiful but fleeting blooms of these trees allude to the transitory nature of life. 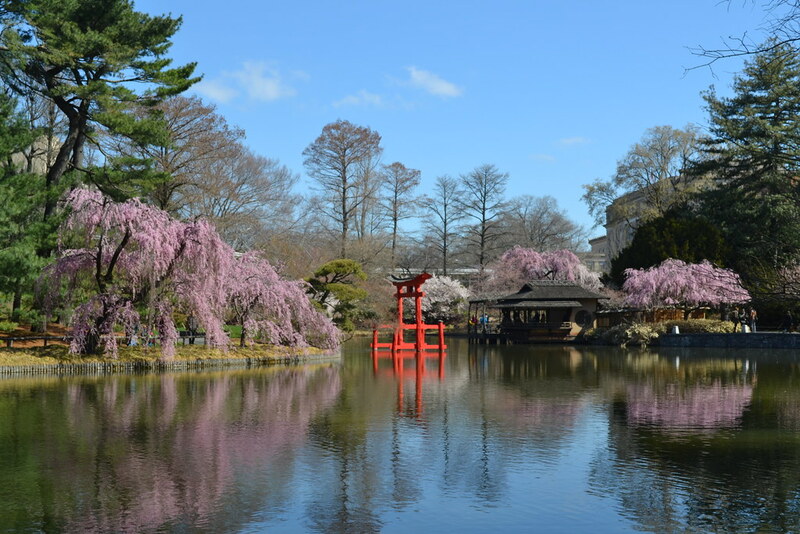 Most of the largest trees—white pine, American beech, and bald cypress—are native to North America and were planted before the site was developed into a Japanese garden. Although it appears natural, the garden is carefully controlled: Some of the pines are pruned and trained to look old and windswept, and other trees and shrubs are tightly clipped to represent hills and clouds. Decades of highly skilled pruning and maintenance have produced living works of art that are the hallmark of a fine Japanese garden. Curator Brian Funk artfully maintains the balance between the man-made and natural elements found in the Japanese Hill-and-Pond Garden. Brian first joined BBG as a gardener's aide in 1999 as it was undergoing a major restoration, a pivotal time for the garden. He was promoted to curator in 2000 and given the opportunity to choose new plant selections, including a variety of bamboos, perennials, and shrubs such as Pieris japonica and Nandina domestica, for use as groundcover, shoreline plantings, and privacy around the perimeter. The restoration was recognized in 2001 with the New York Landmark Conservancy's Preservation Award. 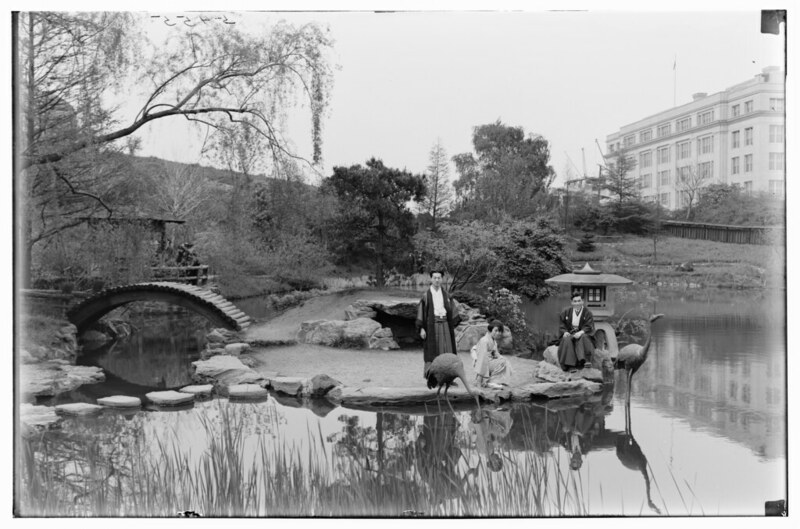 The Japanese Hill-and-Pond Garden was the first Japanese garden to be created in an American public garden. It was constructed in 1914 and 1915—at an initial cost of $13,000, a gift of early BBG benefactor and trustee Alfred T. White—and it first opened to the public in June 1915. It is considered to be the masterpiece of its creator, Japanese landscape designer Takeo Shiota (1881–1943). Shiota was born in a small village about 40 miles from Tokyo, and in his youth he spent years traversing Japan on foot to explore the natural landscape. In 1907 he came to the United States, driven by an ambition to create, in his words, "a garden more beautiful than all others in the world." Cherry trees blooming in BBG's Japanese Garden. Photo by Ruiyan Xu. 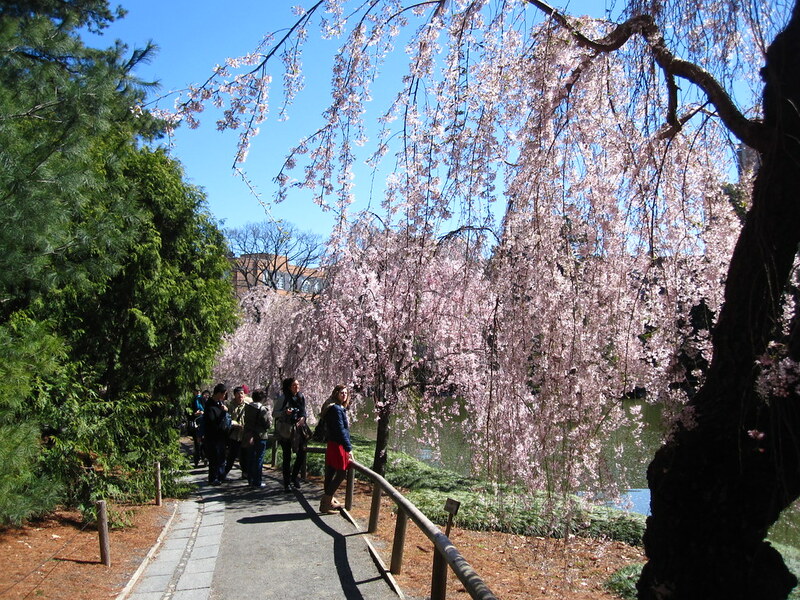 Visitors admiring cherry blossoms in the Japanese Hill-and-Pond Garden. Photo by Rebecca Bullene. This delightful guide includes profiles of iconic Japanese-style public gardens, a primer on the historical roots of various styles, commentary by the most respected names in Japanese garden design, and practical information on designing and caring for a Japanese-inspired home garden.